Issue 53 is released TODAY!!! We only went and did it! A zine a month for a whole year, yep the final issue of the year is released today. 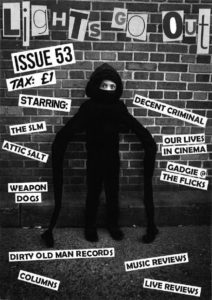 Featuring: The slm, Attic Salt, Decent Criminal, Our Lives In Cinema, Gadgie Fanzine @ The Flicks, Band profile (Weapon Dogs), columns, music reviews & live reviews! I’m sure you’ll afford us a little break in the new year while we regroup and have a think about plans for the zine in 2018. Huge thanks to everyone who bought the zine this year and especially to those who had the faith in us back in January and subscribed for the year, it’s much appreciated.